Even those with the most cursory knowledge of the Great Highland Bagpipes are aware that they are very loud instruments. This provides pipers with a challenge not often found with other less booming instruments, that is, finding a place to practice where your playing won't annoy anyone else. Finding a place to practice using the relatively quiet practice chanter is comparatively easy, but where does one practice with a full set of pipes? As a new piper, I remember hearing or reading stories of the sound of bagpipes carrying for several miles under ideal conditions. In the dead of night, I can hear sea lions bark from well over two miles away. A sea lion bark when measured from about 2 meters, ranges from about 90-105 dB and while we're talking a different range of frequencies, this volume is similar to that of a set of Great Highland Bagpipes. Pipes heard from a couple of miles? I believe it's plausible. We'll discuss some possible practice spots. By far, the most convenient place to play will be in your home. Go around and talk to your neighbors in advance and invite them to contact you if they have concerns about volume of your pipes—better to have them call you than the police! This may sound corny, but a plate of cookies can go a long way in positive neighbor relations. The key is to keep the communication channels open. If your neighbors love bagpipes, you might be able to play at home with very little concern, but even if your neighbors do love pipes, they may get a little tired of it day in and day out. In an effort to keep the peace, avoid playing late at night and early in the morning, or perhaps as your neighbors told you, when the toddler is sleeping each day at 1:30 p.m. Again, the key is to keep the neighborhood communication channels open. Sound is in many ways like water—if there's any gap, it'll get out. If you are looking to soundproof a room (or a garage), you have a to seal every possible way for air to escape. After sealing, the next concern is insulation, for example, if you have a perfectly sealed thin metal box, the walls will absorb but reemit the sound—you need something to absorb the sound energy and turn it into some other form of energy, namely, heat. You need your practice space to be sound sealed and sound insulated. You first step is to select your room and if you aren't sure if sound emanating is still too loud, just ask someone to go out and listen while you play then ask for their thoughts. You can repeat this after you take steps to soundproof your room to gauge their effectiveness. If you have a the money, time, and the room, you can build a sealed and insulated enclosure somewhere within your house or apartment. This method is known as "room-within-a-room" and is sometimes abbreviated "RWAR." This works by a process called "acoustic de-coupling" whereby the sound waves "have the bridge removed and they have to swim across" to continue to propagate. You'd also want to insulate the interior of this special room to control echos. The problem with a simple RWAR is there is no air circulation, so it will build up heat and carbon dioxide as you use it. If you get really fancy you can install a fan with an insulated duct with at least one right angle to act as a baffle. Constructing a RWAR can get fairly complex, and if you wish to pursue it as a possible solution, there are plenty of articles on the Web about it. For the rest of us with limited money, time, and/or room, we can often make do with the existing structure of our homes. A centrally located room or large closet with no exterior walls (i.e., there's another of your rooms on the other side of all the walls) can often serve, as will a basement. 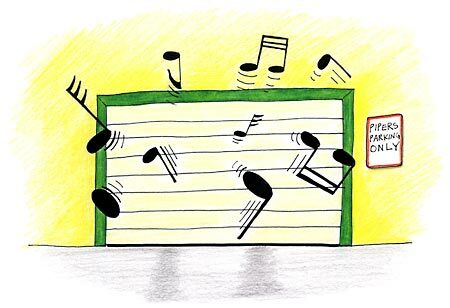 A garage is usually the worst place to keep your playing a secret since it's typically poorly insulated. If it's a room, weather strip the door and make sure it latches snugly. You might consider installing a solid-core door. Stuff a towel at the base of the door. Close any drapes or curtains over the closed windows, and if possible, those windows should be double-paned. For extra help, you can secure a heavy blanket or curtain over any windows; Velcro around the perimeter makes for a better seal. Or if you are making a more permanent dedicated space, board up the windows with drywall and sandbags (or mineral wool a.k.a. rock wool, or Owens Corning 703 Fiberglassyou'll want to cover any raw fiberglass product with fabric). Or you can put up acoustic panels such as those included in the Auralex Studiofoam Designer Kit. If you have no choice but to share your home practice time with, say, family members, consider passing out some comfortable earplugs... you'll need some understanding and cooperative people though! If your home doesn't fit the bill, you might consider approaching neighbors, relatives, and friends for a possible practice space. Or more drastically, you could consider moving to a less-populated area. If you happen to live far away from other people or you live in a valley or in a very noisy area, you may just be able to play outdoors. Just walk two blocks to your neighborhood international airport and play next to the chain link fence and compete with the jet noise, for instance. It may be tempting to play on a golf course, at a park, or at athletic fields, but remember that those pipes carry for quite a ways in wide open spaces, so consider that in your selection. Cemeteries can be a good spot, since the sound of pipes is not going to be unexpected, just don't interrupt a funeral service! If you live near a shoreline away from people, this could work for you. "I'm having no luck so far!" After exhausting homes and other most convenient spots, talk to your instructor or other pipers in your area. Experienced pipers (such as those in a band) may have ideas for good practice spots. Failing that, you can approach schools, businesses, churches, and community groups. If payment is requested, sometimes you can successfully trade a performance or a demonstration for use of their space. Particularly if you are affiliated in some way with a school, there are a number of spaces that may serve for bagpipe practice, such as an empty classroom, theater, gymnasium, chapel, band room, musical instrument practice room, or a meeting room. Ideally, before or after school and far away from other occupied spaces is best. Elementary, middle schools, high schools, and colleges are all possible places to check. As mentioned above, athletic fields are a possiblity but just be aware and courteous of other people. It probably goes without saying, but talk to the staff at any school before using their facilities. Before or after hours, a business may work nicely for practice. An empty office, a store room, a conference room, or even a warehouse or (preferably underground) parking structure. Or perhaps outside a complex of 'closed for the day' business buildings. (Being that I have keys, for years I've used my workplace outside of business hours for practice.) Industrial complexes can be an ideal non-working hours practice location. Or maybe out on the fringes of a vast parking lot. Depending on the church, they may let you use their sanctuary or a meeting room. With most churches, their sanctuary sits unused most of the time and their meeting rooms are used only intermittently. Some libraries allow non-profit groups to use their facilities for meetings, sometimes after hours—which is what you would be interested in. (Paying during open hours is impractical for obvious reasons!) You'd need to find at least one more piper or musician to form a "group" and you'd need to find out from the library exactly what the requirements are to allow use. Maybe if volunteer at the library a bit, they might be a bit more open to helping you in return. You can check with community centers, fraternal group meeting halls (Knights of Columbus, Elks, Lions, etc. ), Legion or VFW halls, a National Guard or Army Reserve Armory, firehouse, police department, or other community service organizations. A fairgrounds might be suitable as well. Some pipers (or groups of pipers) have had success using the back rooms of dining facilities. A noisy venue might not notice the sound eminating from the back. The facility might want a public performance from you once in a while in exchange for letting you use your space, but it's typically to your benefit. If you have access to a "recreational vehicle" (RV) or a delivery truck, the interior may serve as a practice space. If a bit unorthodox, playing seated in a van may work as well. A big advantage of such a space is that it's easy to move it to an uninhabited area. It may also be relatively easy to keep warm in winter by using the vehicle's heating system. If you have the funds, you can rent a unit at a self-storage facility. Look around for the largest facility or one that is located in a business or industrial district. If they don't have a blanket policy against playing loud music, ask for a unit in the middle of the facility which should be farthest away from human ears. If you decide on a location where you can be heard in the vicinity, you might do well to rotate your practicing spot so that you don't subject the same listeners to your practice constantly. Perhaps a Monday in the backyard, Tuesday at the park, Wednesday behind the school, etc. Also, you're less likely to get complaints if you don't try to hack your way through tunes you haven't fully learned yet when people are within earshot. Regardless of where you end up practicing on a full set of pipes, considering that many pipers even wear earplugs outdoors, especially remember to wear earplugs if you are playing in a small enclosed space. If you just can't find somewhere to practice. There will be times when you can't find a good place to practice on your pipes. Dedicated pipers will do their best to practice when and where they can. That usually means an arsenal of practice chanters, electronic bagpipes with earphones, mouth-blown or bellows-blown smallpipes, a practice goose, etc. You want to work your way down the ladder of possibilities, for example, if you can't play Highland pipes, play smallpipes, if you can't play smallpipes, play a goose, if you can't play a goose, play a practice chanter, if you can't play a practice chanter, play an electronic chanter with earphones. Obviously, you may not have all the rungs of that ladder, so work with what you havesometimes that's just a dowel with correctly spaced notches or, heck, even a pencil! Page first created in November 16, 2008.